These days I call myself a runner...: What a trophy! Yesterday, I ran my 21st (and last) race of the year, the Buntingford Year End 10 Miler. It was my second time at the event, which is a relatively hilly, looped course around a bit of housing estate and then the Hertfordshire country lanes. The finish time recorded on my (brand new Christmas present) Garmin 610 was 1:27:57 over 10.1 miles, and I was particularly pleased with mile 7 which I ran in 8:04 but regardless of times, it was a great race to kick me back into serious training, what with the 10in10 just 19 weeks away!! 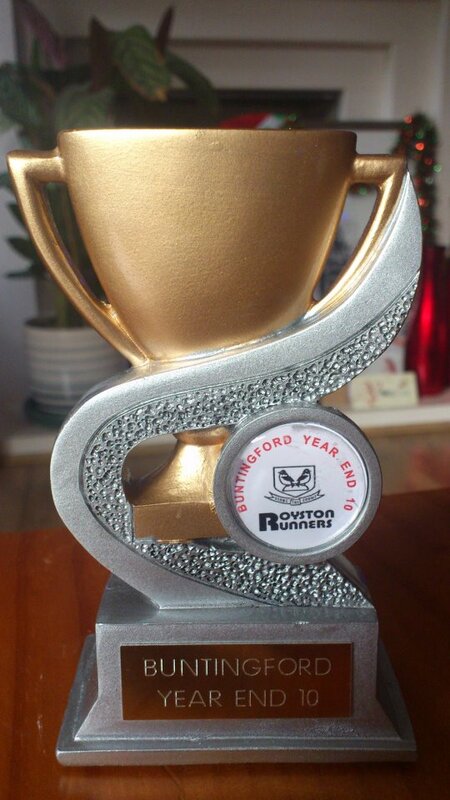 I expect I'll be back to have another go at this race at the end of 2013, not only because it's nice to have a race over Christmas, but also because of the amazing memento everyone gets for finishing..
Last year we were given a silver shoe, and the photo is of the trophy we all received this year! It does seem a bit excessive for a 10 mile race, but I'm taking it as a trophy to celebrate the whole year's achievement, and following on from my last blog post, I'm going to let myself accept it as well deserved.